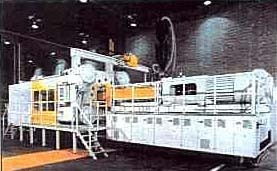 HPM Corporation, a manufacturer of injection molding presses based in Mt. Gilead, Ohio, recently installed a blackening system to replace paint for the finishing of large hydraulic manifolds and other machined components used in its presses. The system provides a much faster and cleaner process for finishing these parts along with a more predictable and controlled level of quality. HPM's injection molding presses cover a full technology range, from toggle clamp injection molding machines to hydromechanical two- platen presses. Sizes range from 60 to 5000 tons. These complex machines utilize hydraulic manifolds and other precision manufactured components, which control the high pressures and temperatures encountered in the molding process. HPM Next Wave Hydromechanical Two-Platen Injection Molding Machine features modular construction to accommodate a wide range of shot sizes, screw torques, injection speeds and pressure. Manifold sizes range from about the size of a lunch box to that of a refrigerator, and part weight ranges from 20 to over 6000 lbs. While the average manifold size is about that of suitcase, all are high-value components, precision-ground for flatness and bored to tight tolerances. And, because these are expensive, precision parts, they must be finished individually. Blackening HPM's manifolds takes 15 to 20 minutes from start to completion. The finish provides corrosion protection and a uniform attractive finish that won't crack or peel. With HPM's previous paint process, the parts were degreased in an agitated washer containing a corrosion inhibitor, then dried and sent to assembly. The hydraulic connections were made at this point and a careful, final hand cleaning was performed. Remaining holes were plugged and those areas not meant to be painted were masked with tape. Black paint was sprayed on and the parts were allowed to dry. When removing the masking tape, technicians had to take extra care so that paint particles did not get into the manifold holes and contaminate the hydraulic fluid. This finishing method provided adequate corrosion protection and presented an attractive appearance, but the paint's 1- to 2-mil coating thickness created problems at times. Some areas on the manifolds, including the hydraulic connections, had to be kept free of paint, and masking them by hand was a slow, tedious process. In addition, it is not unusual for an assembled manifold to undergo retrofitting in order to accommodate last minute design changes. If the assembly has already been painted, it requires stripping, reassembly and repainting, which is time consuming and expensive. HPM management decided to find a better finishing process. Charles Clark, engineering manager, directed the effort to identify finishing options and make recommendations. "Paint wasn't the answer," said Clark, "because it was just too slow for our rapidly growing operation. We had to find a process that not only gave us the desired corrosion protection and appearance, but could also accommodate the rapidly expanding demand for these parts. Of paramount concern, of course, were operator safety and environmental compatibility." After consultations with Birchwood Casey, a supplier of metal finishing systems, Clark's team decided the best method for their needs was the Presto Black process, a surface treatment utilizing room temperature blackening chemistry. "We started small on a prototype scale," said Clark, "in order to evaluate the finish and determine its compatibility with hydraulic oil. We purchased a five-gallon test line to learn the process and measure it against established standards. We blackened a wide variety of small test parts and experimented with different process parameters, testing different rust preventative sealants. Birchwood Casey's labs did a series of separate tests, to determine finish compatibility with hydraulic oils, both mineral oil and glycol types. "Out of this prototype testing came the optimum process and cycle. It gave us the answers we required for a cost of just a few hundred dollars and a small amount of our time. This gave us the confidence to go ahead with the installation of the production scale system." 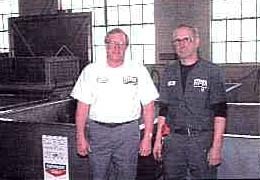 HPM's hydraulic manifolds are processed through five stainless steel tanks, each holding 800 gallons of solution. The Presto Black process itself produces a durable crystal structure on the surface of the manifold parts with the following advantages over the previously used painting process: (1) The Presto Black process forms a chemical conversion finish, bonded to the steel, with no chipping, peeling, or black ruboff. (2) Finish thickness is a uniform 0.000040 inches on all surfaces, protecting both internal and external areas of the parts. (3) Finishing was possible before assembly, thereby eliminating the time-consuming masking operations. 1. CLEAN and degrease in an agitated washer operated at 150°F with 5- to 10-minute dwell time to remove all fabricating oils, coolants, etc. 2. RINSE in clean tap water, purified by Ion Exchange, for 30 seconds. 3. PREPARE SURFACE for blackening by immersing part in SAFE PREP mild acid conditioner at room temperature for 1 ½ minutes dwell time. 4. RINSE in clean tap water, purified by Ion Exchange, for 30 seconds. 5. BLACKEN in PRESTO BLACK PBR at room temperature, 3-4 minute dwell time. 6. RINSE in clean tap water, purified by Ion Exchange, for 30 seconds. 7. SEAL in DRI-TOUCH PLUS IRP3 rust preventative. This step also displaces rinse water from the part. Significant time and labor savings resulted with additional advantages. These included the fact that the system employs a "closed filtration process." No rinse waters or chemicals enter the drains when using the process. This is achieved through the use of Ion Exchange filtration which continually purifies the rinse waters and returns them to the process tanks for re-use. Besides helping to maintain HPM's clean drains, the new process is simple and safe to operate. It requires no high-temperature heating or complicated operating procedures. HPM's workers learned to operate and maintain the system in a single day with on-site training provided by Birchwood Casey engineers. 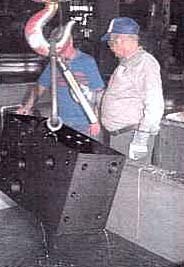 Jim Patterson (right) of HPM directed installation of the finishing system. Terry Kein (left) manages the system's day-to-day operation along with collateral operations. HPM's finishing system requires just five 800-gallon tanks configured closely together in two rows to minimize product movement and conserve floor space. The three rinse operations are done in a single tank purified by Ion Exchange. All tanks are arranged so that parts can be moved from the chemical tanks to the common rinse tanks without dripping active chemical solutions into the other chemical tanks. Measuring 66" H x 72"W x 54"D, the tanks are fabricated of stainless steel and are mounted in a pit in the floor which provides an effective tank height of 42" required by OSHA guidelines. 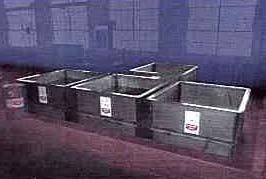 Tank lids cover the chemical solutions when the line is not operated. Capital cost for finishing system was very low. Not counting the agitated washer tank and overhead hoists that were already in place, the five stainless steel tanks, Ion Exchange system, all pumps and fittings were purchased for less than $30,000. Birchwood Casey, 7900 Fuller Road, Eden Prairie, Minnesota 55344-9702. Phone (800) 328-6156, Fax (612) 937-7979.